I got stuck tracing records back on the potential lead that I wrote about in the last post so I decided to give my brain a break from that and work on creating a 4th cousin tree that had the names Lehr and Stigler. The bones of his tree were well laid out meaning it had no holes and I got to work..
What’s cool about this tree, I found pictures along the way and based on pictures and resemblance, I thought hey, this branch looks more like my family than this other branch so I worked on that side first. Let me tell you, I found the shared ancestors! Alpha Stigler married William Lehr and they both died in Sunflower County, Miss. I know I’ve seen Sunflower County, Miss in another tree but I can’t remember which one! I have DNA matches to both Alpha Stigler’s family AND William Lehr but if Alpha and William are the closest shared ancestor between my mom and this “4th cousin DNAmatch” than the actual relationship would be 2nd cousins. 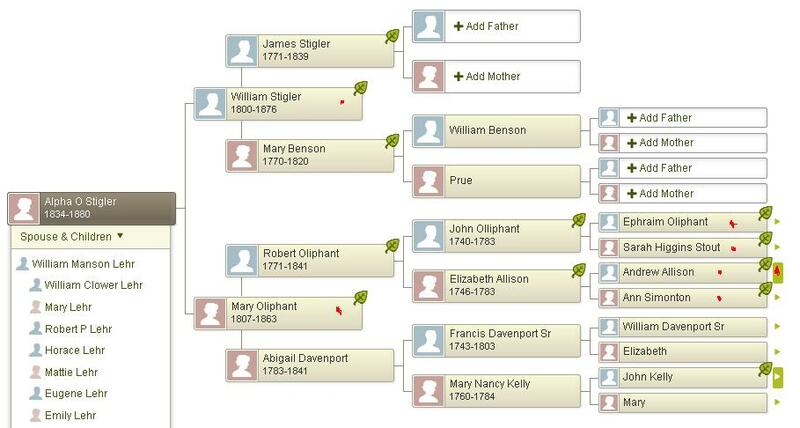 I know it’s possible but I feel like 3rd cousin is more likely. I thought the visual was really helpful in my last post so here it is again. Red “dots” indicate that that ancestor shows up in another DNA match’s tree. I’ve made two visuals – 1 for Alpha’s family and 1 for William’s family. Remember, they married so it is possible that they COULD be the closest shared ancestor but I just have a feeling it’s not. 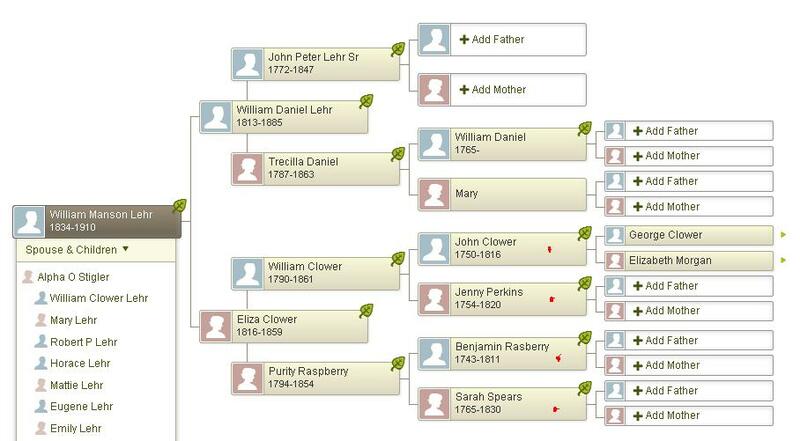 I can definitely confirm the Clower/Raspberry line but is is Eliza Clower? I’m not sure… I can’t at the moment confirm the Lehr line so it is possible that the connection is to one of Eliza’s siblings. This is why I’m not 100% positive that Alpha and William are the closest shared ancestors between my mom and this 4th cousin. As you can see, I definitely have a new connection but I have no idea if there is any relationship between this family and the confirmed Blackwell/Crotts line. Need to do some more digging.